The Bjoulsae River is a major river that forms most of the border between Hammerfell and High Rock. 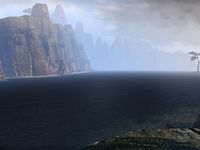 Its source lies roughly south of the High Rock city of Raven Spring and northwest of Hammerfell's Heldorn - about two thirds of the way along the border between the two provinces. It flows through the Halcyon Lake and passes the city of Evermore. It finally enters the sea at the eastern end of the Iliac Bay, near Wayrest. At its mouth, periodic flood plains provide rich soil for agriculture. In 2E 541, a horde of Reachmen, led by Durcorach the Black Drake, crossed the Bjoulsae and began the Siege of Wayrest. The Yrinthi River empties into the Bjoulsae, providing a navigable route from the interior of Tamriel to the Abecean Sea via the Iliac Bay. 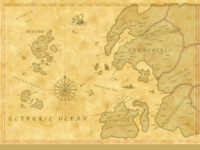 This was the route taken by an agent of the Blades in 3E 405, sent by Emperor Uriel Septim VII on a mission which culminated in the Warp in the West. This page was last modified on 22 December 2018, at 19:08.